QlikView™ is a Business Intelligence (BI) data discovery product for creating guided analytics applications and dashboards tailor-made for business challenges. 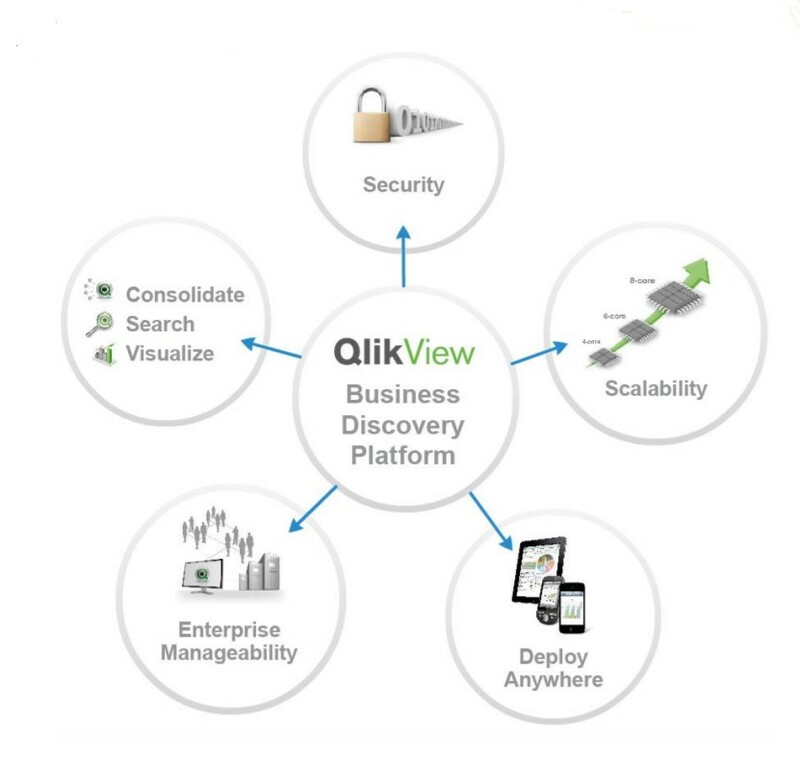 QlikView™ is the most flexible Business Intelligence platform for turning data into knowledge. It’s a way for business users to easily consolidate, search, and visually analyse all their data for unprecedented business insight using QlikView™’s simplicity. Ultimately, efficiency in making decisions is based on the fact that accurate and relevant information is easily accessible. Delivering a fast, time-based learning curve and based on the unique associative architecture in the world, QlikView ™ creates a range of virtually endless options available to users to make ad hoc queries. This does not require the usual definition of structures and hierarchies, as is the case with other data analysis tools. QlikView™ promotes unrestricted application data analysis, helping users make accurate decisions to save time. It brings a whole new level of analysis, understanding and value to existing data sets, providing simple and fast user interfaces. At the center of QlikView™ platform is the patented associative software engine, that provides new insights into though-speed data. QlikView™ compresses data and holds it in memory, where they are available for immediate exploration by multiple users, regardless of the specific requirement. For situations (still rare in Romania!) in which the explored data sets are too large to fit, even with the native QlikView™ compression, in the server memory, there is also an option to connect and read directly from the data source. 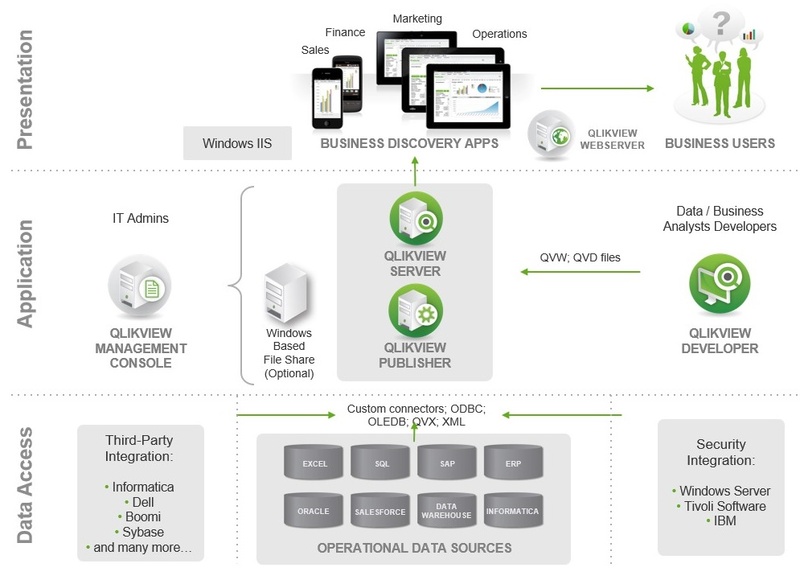 QlikView™ delivers an associative experience for all the data used for analysis, no matter where they are stored. You can start anywhere and navigate in any direction; and are not limited to pre-defined paths or pre-configured dashboards. This tool exposes data that is not found with query-based tools. 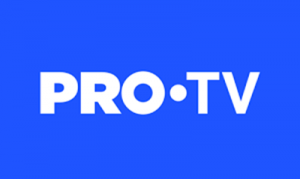 Additionally, the program allows users to build and deploy analytical applications without requiring high professional skills, helping to respond more quickly to changing business requirements, in a shorter time to value and to better knowledge of an organization. Using QlikView™ reduces the need for IT employees, because the software has an inference engine to collect data associations automatically. The tool strengthens data from multiple sources to provide centralized data needed for high-level reporting. Intuitive navigation through dashboards makes it easy for non-IT professionals to understand hidden trends. The application administers user access and control through the web-based management console. QlikView™ comes out of the traditional BI grid, where business users and developers spend months documenting and encoding these requirements into dashboards, analysis, and reports. Data extraction takes a few minutes because data is not required to be staged or stored in intermediary formats such as data warehouses (although QlikView™ can source data from these systems). QlikView™ integrates both the back-end analytics calculations and the front-end user interface. With this complete BI solution, developers have one place to build, instead of having to use separate BI tools for dashboards, analysis and reports. QlikView™ data models can be created in just 1-15 working days (based on data availability and analytics complexity) to provide users with. Often, an application can replace hundreds of reports, reducing the need to IT support and time delays. QlikView™ allows users to get unexpected business insights, understanding how data is associated. They can conduct direct and indirect searches across all data anywhere in the application—globally or within a single field. When the user clicks a data point in a field, the queries are automatically unloaded and the requested view is created. In addition, all the other fields are instantly filtered based on the user selection. QlikView™ simplifies analysis for everyone. QlikTech’s patented technology enables fast data manipulation on masssive sets, involving low-cost hardware platform that allow sophisticated, robust analysis with reasonable budgets. Using QlikView™ can bring value to your business faster as it develops, modifies, implements, and – most importantly – uses business intelligence applications. That’s why QlikView™ also provides tools that can support monitoring the adoption and use of analytics provided to users. Rapid Time to Getting Value – Customers use the solution in less than 30 days, and the fastest within a week. No Risk – available for download, fully functional. Easy to use – End users do not require training. Flexible – Unlimited dimensions and measures that can be changed in seconds. 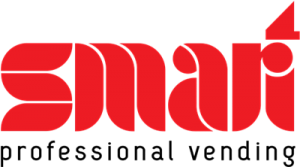 Powerful – instant response time with massive data volumes.